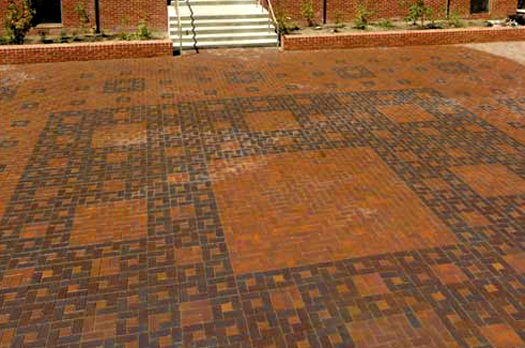 Stretched over the bricked floor and patio of the 10,000-square-foot, multilevel Brown Family Courtyard is a very specific geometric pattern known as Sierpinski's Carpet. First described by Polish mathematician Warclaw Sierpinski (1882-1969), the pattern is formed by dividing one square into nine congruent squares in a 3-by-3 grid, then removing the center square. The same procedure is applied to each of the remaining eight squares and repeated infinitely. Sierpinski’s Carpet is classified as a fractal, a shape that appears similar at all levels of magnification. A fractal is also represented in the spiral created by the golden rectangle.